I kept them pretty simple by using a lot of ingredients I had on hand. The dough is simply flour, water and salt so that was easy. 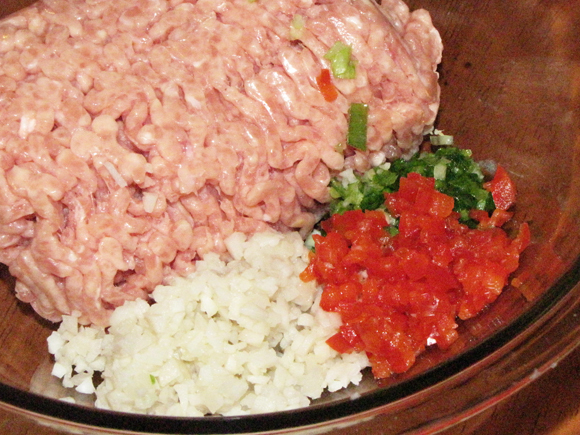 The filling contained ground chicken, garlic, soy sauce, cornstarch, water chestnuts, green onion and red pepper. Yep, that's it! The only thing I had to get was the chicken, chestnuts and onion because I already had everything else in my pantry/freezer. (I usually stock up on red peppers when they're on sale and freeze them in strips or chunks so I always have them ready to use - just thaw and chop!) The ingredients I had to purchase were so inexpensive (less than $4.00 for it all!) and it's a pretty healthy dish so I might just have to make these part of the dinner routine! The best part about this meal though: my little guy got to help. What kid doesn't like to get his hands dirty while rolling out some dough and helping mommy in the kitchen! 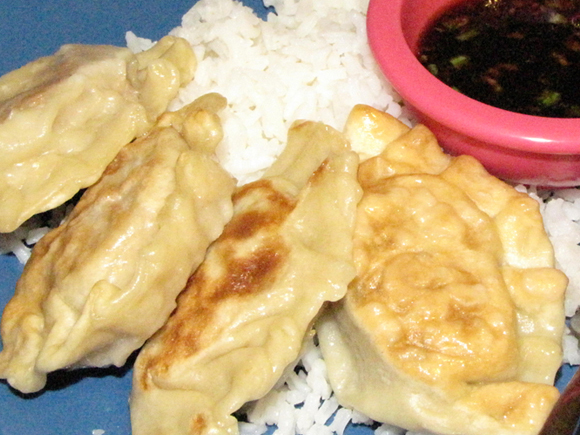 I served them with my own soy dipping sauce (recipe follows the potstickers) and a store bought sweet chili sauce. They're good on their own, but everyone loves food you can dip! 2. Mix flour, salt, and water together in a medium-sized bowl. 4. Cover bowl with a damp towel and let sit for 10 minutes. 5. Knead for about a minute, cover and let sit for another 5 minutes. 7. Cut (or pinch) off 1" sections to leave a 1"x1" piece. 8. Flatten each piece by hand then roll out to about a 3 1/2" circle, keeping the middle of each circle thicken than the edge. 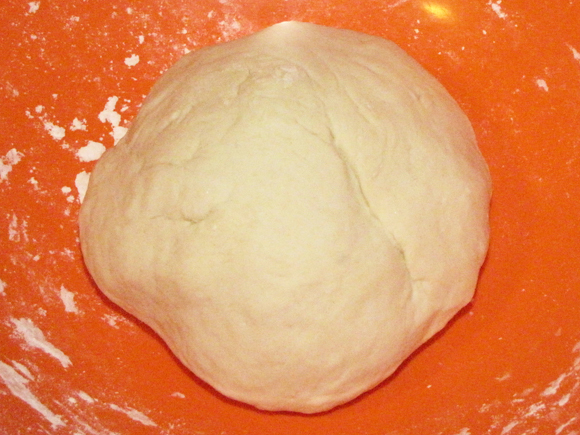 (Roll the edges while you lift and turn the dough with your other hand. Don't roll the circle to less that 1/16" thick. 9. 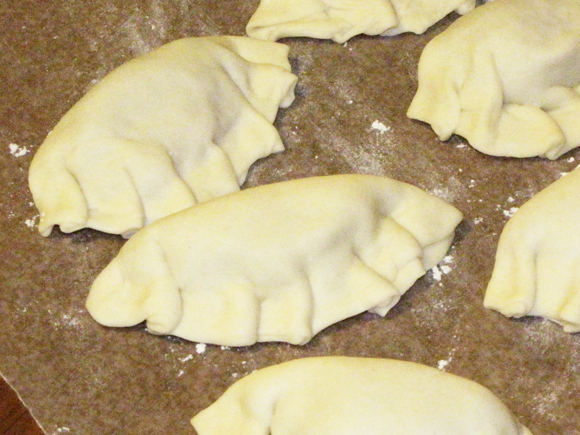 Place about 1 tablespoon of filling in the middle of each circle and fold over. The ends should stick together since it's a fresh dough, but if they don't, lightly put a few drops of water on one end then fold together. 10. 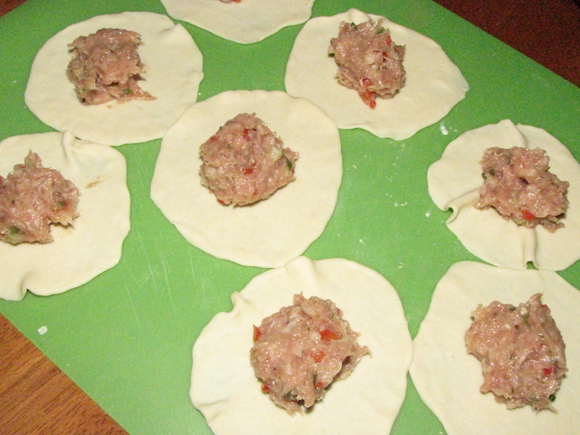 Put about 5-6 pleats in each potsticker's folded side by grabbing the dough and folding a small area over the other. Start with one end and finish on the other. You can either cook these right away or freeze them. 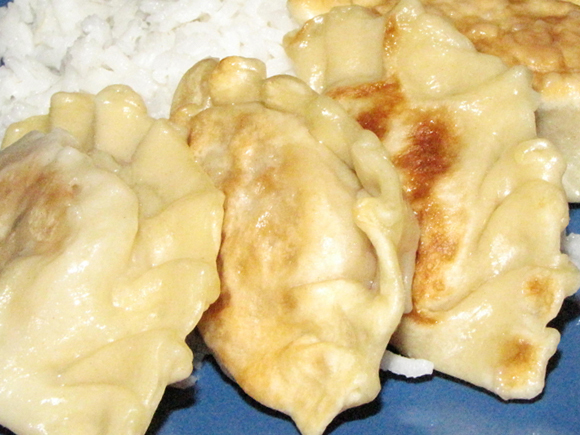 I got 28 potstickers out of this so I cooked half and put the rest on a baking sheet in my freezer until frozen. I then put them in a freezer bag. They should keep for about a month. 1. Heat 2 TB oil in a non-stick skillet with a cover. 2. Put potstickers (careful not to overcrowd) in pan, being sure bottom gets coated with oil. 3. Cook on high for a few minutes until the bottoms are golden brown. 4. Add 1/2 c water, cover and boil until water has evaporated. 5. Remove lid once water is gone and cook for about 1-2 minutes to crisp. 6. 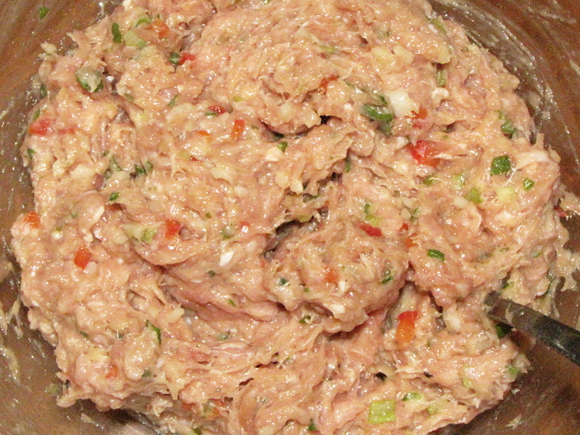 Serve with dipping sauces.